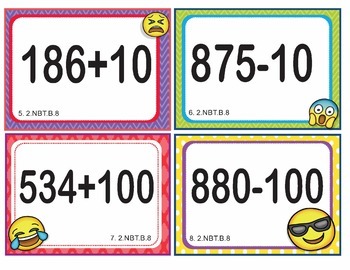 This is a set of 25 task cards with 25 different 2nd Grade math problems, aligned to Common Core 2.NBT.B.8 and various similar state standards. An answer key, as well as a blank answer sheet, are also provided, as well as two posters for the Common Core standard. 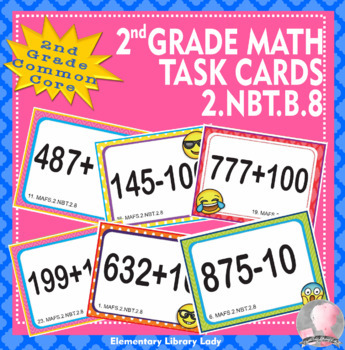 This resource has 25 different task cards aligned to Common Core 2.NBT.B.8 math. 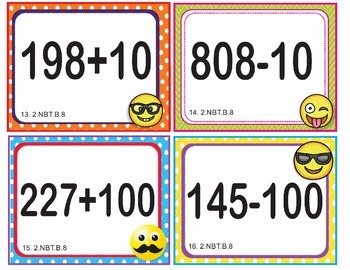 These task cards switch between addition and subtraction of 10 and 100 within 1,000. These task cards can be used for math stations, Scoot, teaching, reinforcing, or additional practice on the standard. 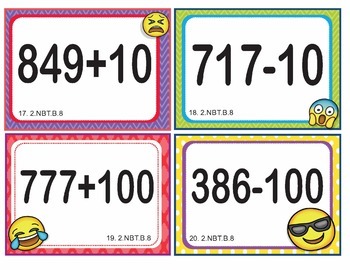 These task cards are created specifically for this Common Core standard.